Combine all ingredients in a food processor or blender. (It’s best if the coconut butter is not solid, and if you use a frozen banana be sure to thaw so it doesn’t harden the coconut butter.) After blending, taste to see if you’d like to add any sweetener. Scoop into a container or even a little pie pan, and put in the fridge or freezer so it will firm up. This is freezer fudge, so it needs to be kept cold. It makes a small serving, but feel free to double or triple the recipe! 6. 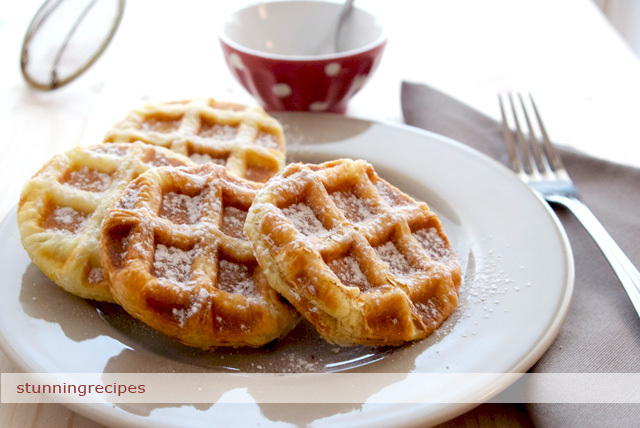 Place prepared pastry circles in the waffle iron, two at a time, (that is if your waffle iron can make 2 waffles at the same time) and bake them 6 to 8min. or until golden brown. Once they are baked, let them cool for 5min., sprinkle with icing powder and serve warm.